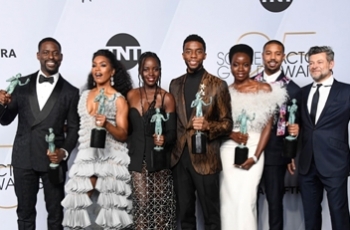 No sooner had the film Black Panther, with its largely African cast get nominated for best film by the OSCARS, that the poisonous pens around the world begun their disparaging remarks, that 'Political correctness' was at the heart of the nomination, not the fact that it was a utterly ground-breaking, yet universal film, superbly acted, that entertained audiences to make the biggest Marvel box office success ever. Black Panther getting nominated for the Oscars is Political Correctness at its' worst." As Black people we often have to wait for opportunities in life, at times being passed over on numerous occasions, only to be told when you do get that job, 'you only got it because you were Black', or, you were only nominated just because of 'political correctness'. This becomes another attack that seeks to place us in the perpetual mode of race inferiority. Sadly, it's constant, everyday, and too often goes without challenge. For example, I was struck this last week during the Australian Open women's tennis, in which the two main female protagonists were non white: Serena Williams and Naomi Osaka. Williams, who, unlike the celebrated white men - Rafael Nadal and Novak Djokovic - is continuously disparaged with a real desire by some to have her knocked off her throne. The other woman, the US Open Champion and world No.1 Osaka, is mixed heritage, Japanese and Haitian Black. The stark reality is truly shocking when we consider that here Blackness, which is evident just by looking at her is not even talked about. It's almost as if to say, 'if you don't mention it, neither will I '. Japanese advertisments go one step further and white-washe any Blackness out of her whenever they can. "We all know what it's like to be told that there is not a place for you to be featured, yet you are young, gifted, and black. We know what it's like to be told there's not a screen for you to be featured on, a stage for to be featured on …"
"we went to work with everyday … we knew not that we would be around during award season or that it would make a billion dollars, but we knew that we had something special that we wanted to give the world." The film Black Panther and its' success give us a glimpse about what a creatively unleashed black industry might look like. Too often white supremacy and its poisonous tool - racism - work on the zero-sum premise that if Black people excel white people lose out. What Black Panther brilliantly shows is that if Black talent can shine, everyone wins particularly the billions made by the film company.